Preheat oven to 350°F. Place the butter on a cookie sheet with an edge all the way around it. Put butter in oven to melt. This only takes a few minutes. Pour pecans into melted butter and stir to coat well. Bake pecans for 4 minutes. Stir pecans and bake for another 4 minutes. When pecans are done salt liberally with the fine grain salt. Pecans should be quite salty. Let pecans cool then chop or break them into small pieces. Beat eggs with hand mixer on highest speed until light and fluffy. Mix Swerve or Truvia and Xanthan Gum together. Sprinkle into eggs while beating on highest speed. Eggs will thicken slightly. Add salt, flavoring and liquid sucralose. 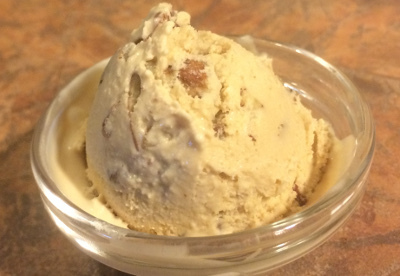 When the ice cream is almost done, stir in pecan pieces.